These manuals sell every day at Amazon, Barnes & Noble, Borders and other online retailers for around $30 each in hard copy format (Regular Price $39.95 each) & $19.95 each in digital format. Since you signed up for my “Mind Force Hypnosis Videos & Reports”, I’m going to give you the chance to get your hands on over 300 pages of information for more than 50% off and also throw you some awesome bonus items to boot. However, what I CAN guarantee is that if you apply these techniques you will definitely be able to start the process of Hypnotic Influence and Control. You’ll learn all about how Self-Hypnosis, Hetero Hypnosis and Hypnotic Devices work… I’ll even let you in on the secrets that Stage Hypnotists use to get people to act a certain way… (if that’s your goal). I know what you’re thinking… So how much is this entire package going to cost me, Al? Well, as you can see, the value of this package, including the Manuals as well as the bonus items, is over $200.00. For that reason, I’m offering this entire set of manuals, the Manipulation Manual, The Hetero Hypnosis Manual, The Self Hypnosis Manual, The 12 Devices Manual, The Videos, Audio Files, Bonus Audio Files in addition to the 3 bonuses. This sells every day on Amazon, Barnes & Noble, Borders and other online retailers for $60 + shipping, or you can find these manuals elsewhere being sold in digital format for $19.95 each…Now you can get all of this for only $39.95 total for All The Manuals +Bonuses! If you think about that in terms of getting these unique abilities that you want in 8 weeks, this comes out to only $.67 per day for 8 weeks! Come on now… even your morning coffee or tea costs more than $.67 per day. Don’t delay, because the FREE bonus package valued at $119.80 will only be available for a limited time due to the fact that I’ll probably release it as its own product, so grab this system today. 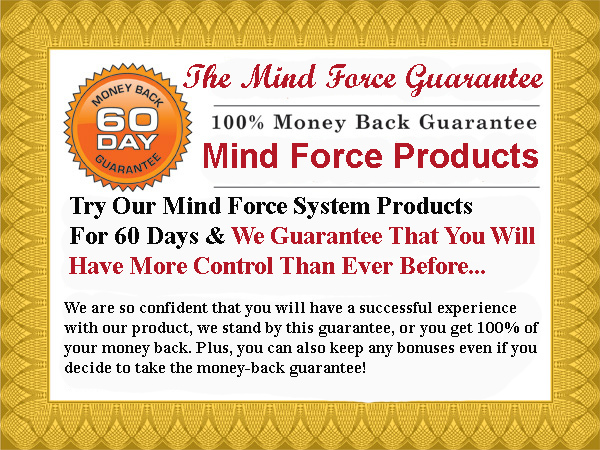 Get started today and claim your Mind Force Hypnosis Manuals downloadable package, and receive this cutting edge program along with $119.80 worth of FREE bonuses, click the following order button below to go to our secure processing page. You’ll Get All (4) Manuals Plus Bonus Items Valued at $119.80! YES A.Thomas, I want in! Please let me. I want All Four Mind Force Hypnosis Manuals Please Give me INSTANT access to this awesome treasure trove of knowledge right now. I understand that upon accepting this form, and placing an investment, I will have immediate access to the all the books and mp3 files, videos and bonus items. I also understand that I will commit time to learning and applying said techniques. PLUS: You get upgrades for life, anytime I decide to add a video, audio file or manuscript at no additional charge ($47 future value). P.P.S. Remember, you are not only getting all (4) cutting edge Hypnosis Manuals, but also the amazing audio and video bonuses. The bonuses alone are valued at $119.80… and you get all of this for the small investment of only $39.95!